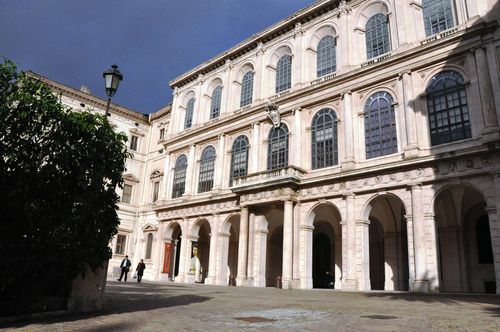 Palazzo Barberini, home both to the powerful clan that produced Pope Urban VIII and to paintings by greats like Raphael, Caravaggio, Titian and El Greco, hasn’t been a proper museum in years. Plans to create a central space for its collection were stalled for decades; until 2006, the palazzo even served as an administrative office for the Italian military. Paintings were split between various galleries across Rome, and even more of them remained in storerooms, hidden to the public. That all changed just a couple of weeks ago. I paid a visit to the newly-restored Palazzo Barberini today, and all I can say is: what a difference a few more rooms make. (Note: This post was last updated with current information in April 2017). The piece-de-resistance of the whole collection long has been Pietro da Cortona’s Triumph of Divine Providence (shown above), the fresco on the ceiling of the Grand Salon, mind-boggling for its size, its spot-on execution of trompe l’oeil, and its sheer over-the-top-ness. Under restoration for months, it’s now viewable in all its Baroque glory. A plus: Two comfy, long sofas let you stretch out on your back to take it in without hurting your neck. But there are other jewels in the collection that are only now being shown off, too. Medieval pieces that had been undisplayed, including 14th-century scenes of crucifixions and sad-eyed Madonnas, now take up several rooms. A hall of landscape paintings includes several sweeping works by Paul Brill. And one room just opened to the public features a rushing fountain, a little piece of indoor theatricality in a time that loved everything unexpected and dramatic in art. As well as the art itself, the museum experience has improved. A description in English and Italian greets you in each room, giving an overview of how the pieces link together (usually, by period and geography), and the flow of your visit is set up so that you progress from the 14th century all the way up until the 17th. And because there’s more room, the pieces aren’t as crammed in together. With its new rooms, the Palazzo Barberini should take you about two hours to get through. The Palazzo Barberini is located just steps from the Barberini metro at Via delle Quattro Fontane, 13. It’s open every day but Monday from 8:30am-7pm, making it an ideal early-evening stop. The entrance price is currently €10. 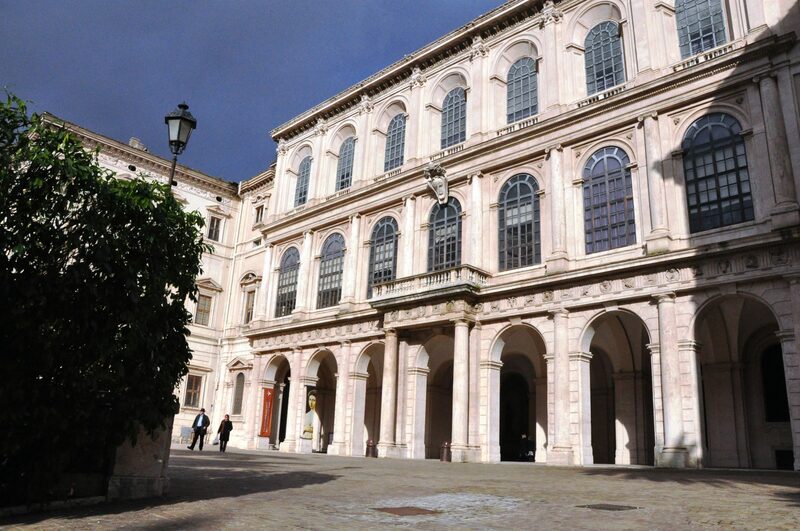 For more on Palazzo Barberini, click here. 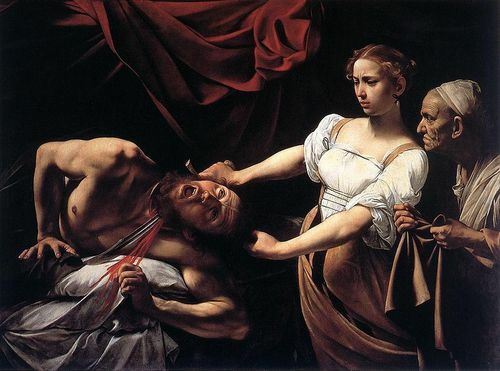 Click here for more information about Palazzo Barberini, including on the pieces that have always been the main draws of the collection, like Raphael’s La Fornarina and Caravaggio’s Judith Beheading Holofernes. Also: a good reason to head “outside the walls,” books about Italy to put on your must-read list and an answer to the question: is Rome really safe? Rome’s Palazzo Barberini is one of the best places to go if you’re tired of Rome’s overwhelming art collections (think: Vatican museums), but want to see more of what Rome has to offer. A stunning art museum in a Renaissance palace, it’s an often-overlooked gem in the heart of the city. Palazzo Barberini boasts works by some of Italy’s best painters: Caravaggio, Raphael, Tintoretto, Bronzino. Its stars include the lush and moving “La Fornarina,” Raphael’s portrait of his lover (and possibly secret wife), the baker’s daughter; Hans Holbein’s famous portrait of King Henry VIII; and Caravaggio’s startlingly realistic — and frightening — Judith Beheading Holofernes (above). For fans of Baroque art, the building alone merits a visit. Started in 1627-1633 by Carlo Maderno with his nephew Francesco Borromini, construction was handed over to Borromini and his soon-to-be-rival Bernini. (Yes, that Bernini. Some of his sculptures are also inside). 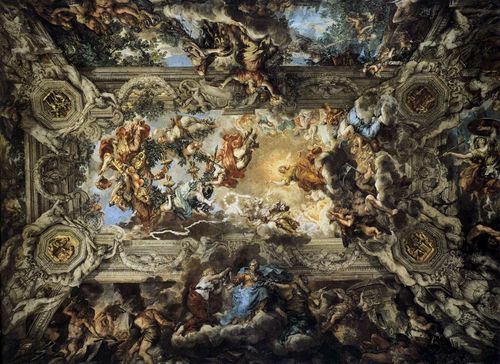 The palace’s frescoes include Pietro da Cortona’s famous “Allegory of Divine Providence”; a triumph of trompe l’oeil, it literally “tricks the eye” into thinking that the ceiling opens up to show the heavens and tumbling figures. But it’s also a political piece, a tribute to the Barberini family — the powerful clan whose Maffeo Barberini became Pope Urban VIII (and started construction on the building). 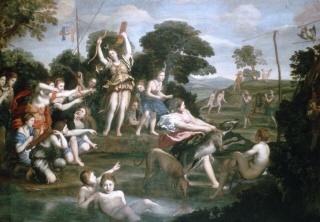 But the piece-de-resistance is Pietro da Cortona’s Triumph of Divine Providence, the fresco on the ceiling of the Grand Salon, mind-boggling for its size, its spot-on execution of trompe l’oeil, and its sheer over-the-top-ness — which benefited from a months-long restoration in 2010 and is now on full and stunning display. Also: why the Borghese Gallery should also be on your list, the best places for gelato and Rome’s most fascinating archaeological museum. There may be no artist better suited to the night than Caravaggio — the tormented Baroque painter famous for his dramatic, almost theatrically-lit paintings. And on Saturday night, Rome is offering up its Caravaggios to the public. 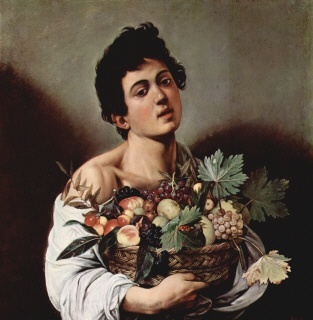 From 7pm on Saturday, July 17 until 9am on Sunday morning (yes, all night), four different sites will be open and free: the Borghese Museum (right now, ordinarily a €10.50 entrance), with its "Boy with a Basket of Fruit" (above), "Sick Bacchus," and "Madonna of the Snakes," among other pieces; the Church of San Luigi in Francese, home to Caravaggio's first major commission, the three frescoes of St. Matthew; the Basilica of Saint Augustine, with its Madonna of Loreto; and the Basilica of Santa Maria del Popolo, with its Crucifixion of St. Peter and Conversion of St. Paul (open only until 1am). 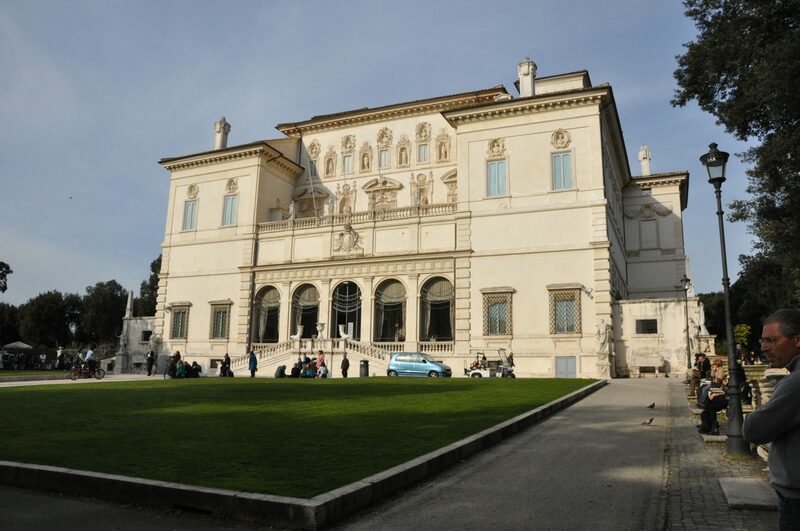 Just be prepared for a queue at the Borghese, where Romans are most likely to flock… although the later you go (or the earlier Sunday morning), the more likely you are to to have the museum to yourself.